I put all those triangles to use this weekend and a mini-quilt was born. It still needs to be pressed, and then I think I’ll make it into a size we can use around the house. The quilt turned out fab. I got myself a bunny this weekend. The kids think I got it for them… I didn’t. As long as they clean out the cage though we’ll keep it our secret. What a sweet little guy :) We had a bunny growing up, actually it was my sisters… He was a holland lop and we called him Bunners. BUNNIES! I want a bunny too, not for the kids, but for me. I'm just going to use the kids as my excuse. You are a smart, smart lady. I die. That bunny is too cute! I want that bunny! Sooo cute! Bunny is so cute! 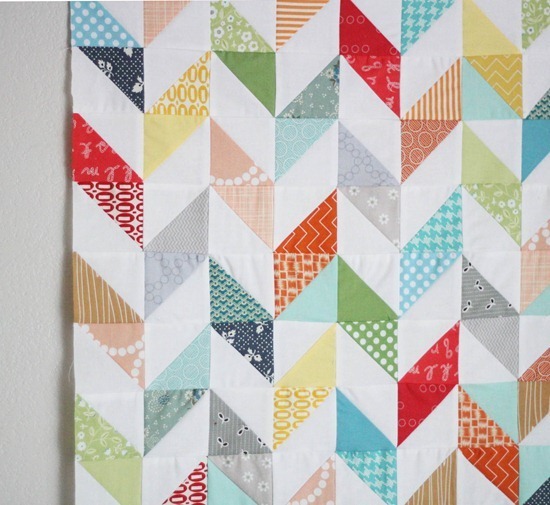 Love the quilt, it looks like a herringbone pattern. My kids beg for one, but with 2 cats (inside) and 6 full-size hens (outside), and wild Coopers hawks, I am not sure where a bunny would go. Lovely quilt! I really like how you used two triangles in the same tone. Really looks awesome. And what a cute bunny! by the way my blog is dreamwoodphoto.blogspot.com – come on over. What a sweet little bunny, and pretty quilts too! Oh so sweet (the bunny, but the quilt is nice too). Your posy post made me think about my childhood growing up on a farm. We got bunnies right after moving there and were told they were both males. Peter had babies shortly thereafter. We had tons of bunnies and I still have a few photos of them. Unfortunately I'm allergic now, but I love going to look at them at the county fair. Lucky you! LOL Your husband must be my husband's long-lost brother LOL. I love that you got you a bunny—you go girl! :) Love that quilt too. Great job. Oh my gosh! Is he not the cutest?! What will you name him? 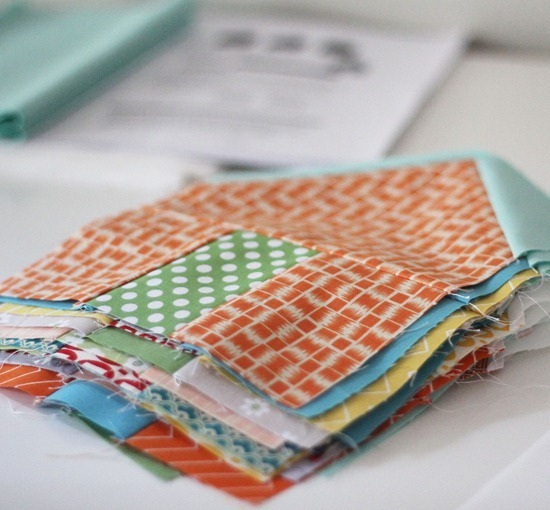 Your half square little quilt is adorable. I dont know what it is about half square triangles but I love them. I want to make a whole quilt using just them. We have two bunnies that are a bonded pair. They are litter trained and have free roam of our house and I love them to death! Make sure he eats lots of hay and fresh veggies and he can live a very long time! Wonderful pets, hopefully mine will forgive me for the kitten we are adopting this weekend..
Beautiful quilt, adorable bunny. This blog post has it all! Congrats on the new addition to the family! What's your bunny's name? He reminds me of Jeni at In Color Order's bunny, George. I love your triangle quilt. I've always wanted to do a scrappy triangle quilt with prnts/white ever since I saw a vintage quilt like that at a beach house we rented. He is just adorable! Congrats on your new baby wabbit. So sweet. OK, I'm stealing your design idea – I'm liking that very much! Bun-bun is too cute! My mom grew up having a rabbitry, but it was during the Depression, and they were not for pets and she didn't give them names…..
We had calves and goats and ducks and geese and sheep, as well as cats and dogs as pets when I was growing up. I think she was making up for the bunnies. Now, if I just had kids at home that would clean the cage… sigh… =(. Have the kids named the bunny yet? He's adorable and so luxurious looking? I love your scrappy project, the colors are so pretty!! Congrats on your newest family member, how sweet!! I've been tempted to get "the kids" a bunny, as well! That pic is really tempting me!! Does he have a "stitchy" name?? My husband says we have to always live in the city. He won't let me move to the country, because he says he needs the city ordinances to keep our pet population to an appropriate number. I'd own one of everything if I could!! Have you or the kids named that gorgeous bunny? Love the triangles! Great colors. I want a bunny too, but I am waiting for just the right one. It (he or she) needs to be white and really fuzzy, so I can brush it and spin it's fur. I want to spoil it. I think that won't be too hard. Love that quilt. I have a bunch of HST that I didn't know what to do with. Now I do! Thanks for the inspiration! I love the quilt. The colors are beautiful. Love the quilt and the bunny, but I'm a sucker when it comes to critters of any kind. Have you named him yet? Love the HST quilt top. That's one cute bunny-you need to get another though as he might get lonely. Pretty pretty. And the bunny is just adorable. I'm not going to show him to my kidlets. They'd eb begging me for one. Love the quilt and the bunny too…. Bunny luv!! As always, you are an inspiration. I also am interested in what quilt those house blocks belong too!!??? Do tell? I am so jealous! I have always wanted a bunny! Bunny droppings make the ideal fertilizer — the perfect balance of chemicals, from what I've read, so the bunny is really an investment in your garden! See? It's all perfectly clear that you NEEDED that bunny. So much cuteness! Your bunny is just darling! Congrats to the new bunny mom. I miss my big guy so much! I had a Flemish Giant. He was a big boy. You'll enjoy him so much. Just be sure to pick him up alot and pet alot! Love your little triangle creation. Thanks for sharing. He is sew cute! Love the quilt also! My oldest daughter, all my daughters are grown and live away, has just lost her pet bunny to old age. She was sad for days, he was very sweet. What a cute bunny!! And what an adorable quilt!!! It is a great use of sraps. I was wondering what size of square you made?? Always enjoy checking in with you. 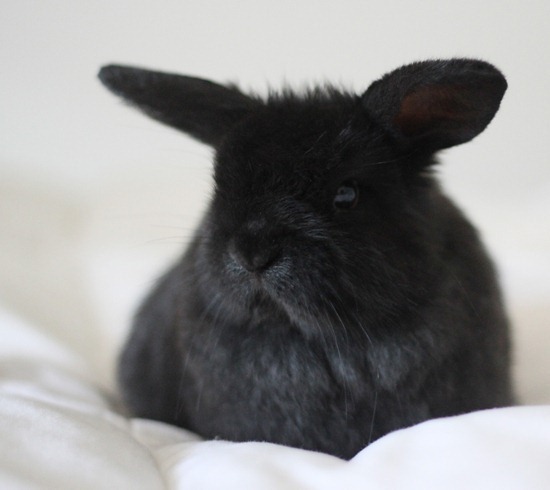 We had a lop-ear bunny named Alex. He used our kitty litter box on his own. He used to do laps around the living room and them jump up on the couch and sit on our laps. Was sure a sweetie! Oh my, that bunny is just the cutest. My husband wants a bunny, but I won't let him. In my defense though we have two Labradors and 4 cats… If the labs didn't eat it, the cats would gang up on it I'm sure! Cute bunny!Just in time for Easter too. I would like to get a bunny for my kids. They are an easy pet, especially when we rent a house and can't have a dog or cat. I have just discovered your blog, and love your work! 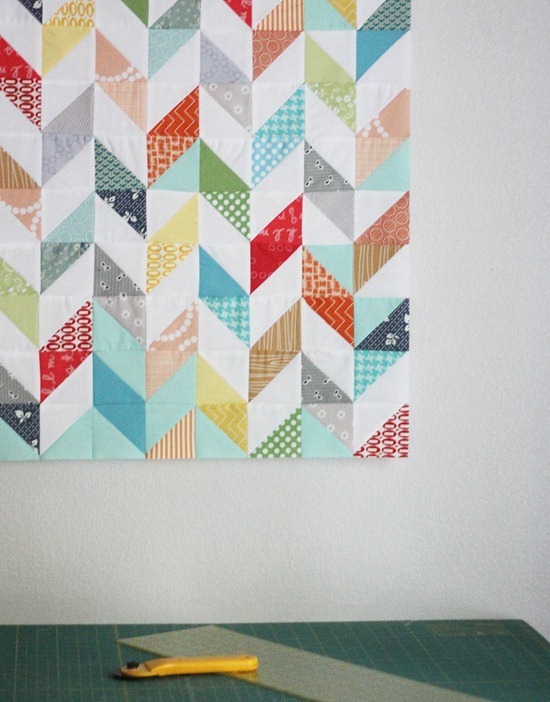 I like the way you have played with the colour on your triangle quilt, and can't wait to have a go – thank you! Love the quilt and the bunny! Is it a Holland Lop? Our bunny we had for 10 years died a year ago. Now we have a 9 pound dark brown rabbit named Bates. I love having rabbits, though I have to disagree that they're always so 'calm' like someone said… it does train you never to leave fabric, quilts, or books on the floor or within reach, though! (Sugar and Spice) at our house. I don't think they are as mellow as yours though. Bunnies are so wonderful! I had a mini lop for years. He was litter trained and my cat adored him. Be sure to give him a fruit tree branch to chew on. Enjoy! Well done great work.I like it.